In January and February the flowers of winter arrive, blooming as cheerfully as the showoffs of spring. One of the showiest of the cold-weather shrubs is Mahonia ‘Charity,’ a relative of native Oregon grape with bountiful spikes of yellow blooms. The large evergreen leaves give the plant a tropical look and make it a standout year round. Snow is no deterrent for this easy-care, 10-foot shrub that will take temperatures down to minus 5. A bonus is the multitude of blue berries. For those who are only familiar with camellias that bloom in spring, Camellia sasanqua will come as a pleasant surprise, Bell said. Blooming right smack in the middle of winter, this 8-foot camellia doesn’t get the mushy, brown flowers some hybrids display. 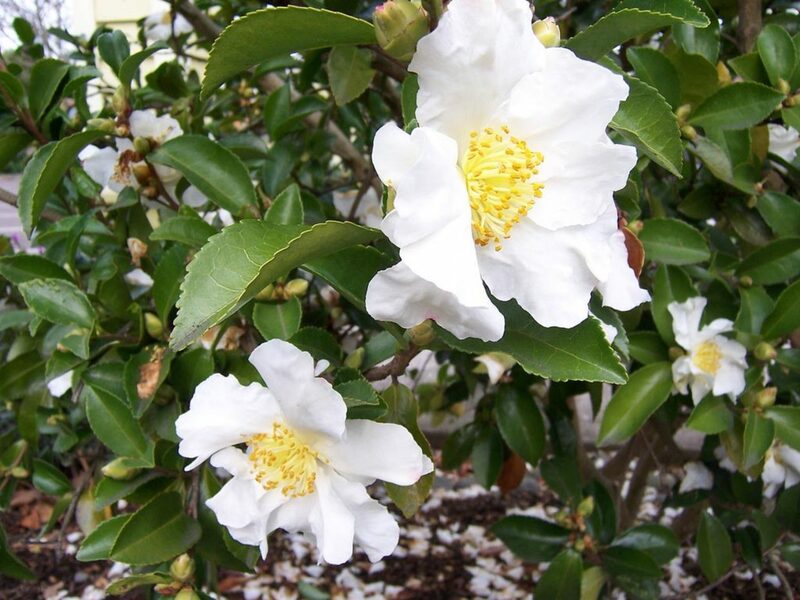 White-blooming ‘Setsugekka’ is easily found, as is ‘Yuletide,’ the most popular of the Camellia sasanqua with its Santa Claus-red flowers decorated with prominent puffs of yellow stamens that provide sustenance for overwintering Anna hummingbirds. In the darkest part of the year – sometimes before Christmas – the vanilla perfume of sweetbox hovers on the air. The small white flowers aren’t a big deal, but the scent more than makes up for that. The shiny, dark green foliage is similar to its relative the boxwood and useful as a hedge or backdrop for colorful perennials and annuals in other seasons. Several species are on the market, most commonly Sarcococca ruscifolia and S. confusa, both topping out at 5 feet. They’ll take temperatures down to around 5 degrees and grow happily in shady, dry areas of the garden, where most other plants turn up their toes. Bell mentions Grevillea victorae one of his favorite winter-blooming plants. The 8-foot tall and wide evergreen shrub with small gray leaves and stems can bloom September through April once it gets established. The unusual red-orange flowers emerge from rust orange buds making it a standout in the garden. It’s attractive to hummingbirds and bees. Blooming December through March, two months earlier than the Oregon native flowering currant (Ribes sanguineum), is the chaparral currant (R. malvaceum) of the California coastal ranges. The 5-foot shrub attracts hummingbirds that will sip the nectar and forage for bugs among downward-facing pink flowers. Because the foliage is aromatic, many gardeners will be happy to know that deer will typically leave chaparral currant alone. Bell can’t finish his list without mentioning native silk tassel (Garrya elliptica). There’s no missing the waterfall of catkins dangling in long chains of 6 inches or more. The large shrub can grow up to 12 feet tall and wide, has glossy green leaves with white undersides and is drought tolerant. These six shrubs, all of which are hardy down to about 10-15 degrees or lower, are on Bell’s short list. Others worth researching, he said, are witch hazel (Hamamelis), winter jasmine (Jasminum nudiflorum), Viburnum ‘Dawn’, wintersweet (Chimonanthus) and Harry Lauder’s walking stick (Corylus avellana ‘Contorta’).